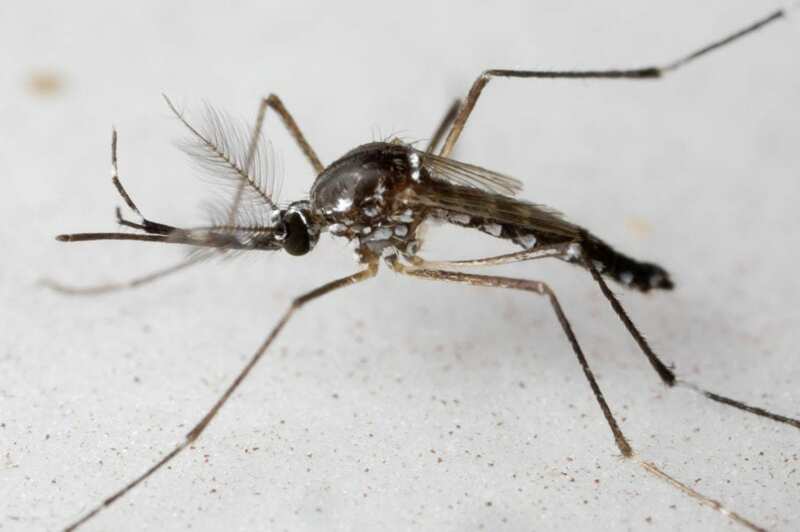 Annapolis, MD; November 7, 2018–In the global effort to prevent diseases transmitted by mosquitoes, several promising new techniques for reducing their populations are all based on a single concept: fighting mosquitoes with mosquitoes. In an experiment that tested how well mosquitoes survived a 24-hour shipping process, Chung and colleagues found that the optimal protocol was to pack them at a rate of about 240 mosquitoes per cubic centimeter–or, in other words, nearly 1,200 mosquitoes to a teaspoon. "We started our experiments in 50 milliliter tubes and quickly learned that you have to raise a lot of mosquitoes to fill such a tube–10,000 males fit in one. We then switched to 10 milliliter syringes and were astonished how many mosquitoes you can fit into one, up to 2,500," says Immo Hansen, Ph.D., associate professor at NMSU. Chung is a lab technician in Hansen's Molecular Vector Physiology Lab at the university. In the 1950s, a pest-control method known as the sterile insect technique was first successfully developed and deployed to eradicate the screwworm fly in the southern United States, and it has since been replicated in several other settings against other insect pests. Flies can be transported in their pupal form in crates by the thousands, and they can be released at a central point from which they will fly away across large distances. Mosquitoes, on the other hand, are more delicate, and an adult mosquito will fly no more than about 200 meters in its lifetime. That means mosquitoes released for population management must be physically delivered in batches to precise locations. Unmanned aerial vehicles–i.e., drones–are a likely candidate for this job, but they need to be equipped with release systems that ensure the mosquitoes make it to their destination alive and fit to fly. To explore how such delivery systems might be designed, Chung and colleagues also subjected Aedes aegypti mosquitoes–a primary vector of yellow fever, Zika, and dengue–to storage at various temperatures, and they found 14 degrees Celsius (57.2 degrees Fahrenheit) resulted in the highest survival rates. They then conducted the shipping and handling experiment at that temperature and tested various compaction rates. To pack the mosquitoes–all males, as would be the case in use of the sterile insect technique–the researchers placed a precise number of mosquitoes in a 10-milliliter syringe tube (see video) and inserted the plunger to compress them to the 1-milliliter mark (1 cubic centimeter). Then, for the shipping test, those tubes were packed securely in a Styrofoam container with a cooling element and shipped via overnight courier from Las Cruces, New Mexico, to Davis, California. Upon arrival, they were immediately released and examined for survival rate and damage by research team members at UC Davis.